Photo Matching by Email. If you choose to email a photo we will give you are opinion. We do not guarantee the match. Please read the instructions !!!!!!! We can see the side and the top front. We offer opinion we do not guarantee a match. Photo matches Available Monday- Friday. Evening & Weekends possible if we have a volunteer. Weekend photos may not be returned until Monday. EMAIL MATCH POLICY: We do are best to help you but need your help. We accept ( 1 ) photo to view. If you send more than 1 we will go on the photo we feel is best. We ask that you have the childs hair in a ponytail or Pigtails with any products you will use already applied. Single Hairpieces cover most of the childs head including a bow, accept a few inches on top and the front sides. The photo should be of the front / side. Photo for pigtails the full side of the chids head. We need the photo to be in naturel day light. We rely on your photo. You represent your childs hair in the photo. Please make sure it looks correct to you- before emailing us. Photos of the back of the head or ponytails will be matched that way however we do not suggest it . You must include the style name(s) you wish to order and the colors you are inbetween on choosing from the online chart located on that styles page. You need to mention any red tones. If you send a photo that is not like the one we display above we may ask for a new photo or match it to the one you send not asking questions. STAR STYLE: Human hair, If you need help order a consultation on this styles order page at the bottom. A human hair specialist will contact you by text. 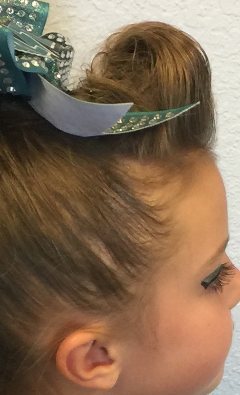 Cheerleaderhairpieces ( 19 years) in business displaying online photos. We always will do are best to show you the color representations properly. It can seem difficult however 99% of customers do not exchange for color ordering off the online charts. Trust your opinion. We offer color synthetic color rings that you can order this gives you hair swatches in hand to hold up and match. If you are concerned about choosing the correct color and have a few weeks before you need to order, we suggest a color ring. See color rings. The Piggies style and Barrel curls color chart represents the colors with a gel base , this is how the hairpieces actually appear. Its best to match to those color charts online. See Contact section in the menu for the email address to forward the photos. Thank you for respecting the above information as we do not have a large staff. We make every attempt to keep costs down for customers by utilizing staff properly. We will not answer time wasting texts or emails from customers who do not read instructions.